They key to smoking a whole chicken is knowing the perfect time to take it off the smoker. This can be difficult because it is such a large cut of meat made up of many smaller cuts. Wings typically tend to get overcooked before the larger breast meat is fully cooked. The key is to use an instant-read meat thermometer and stick it in the deepest part of the breast meat to check for an internal temperature of 165 degrees. 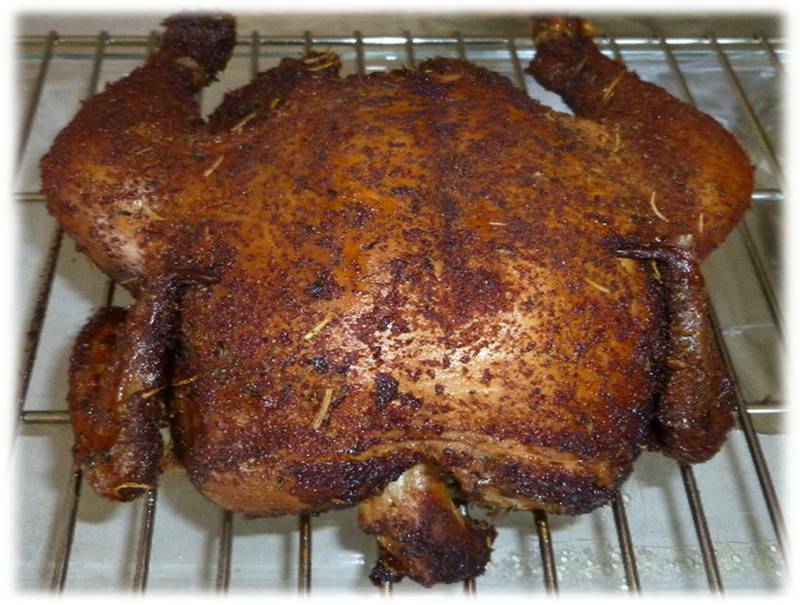 Depending on the style of smoker you are using, it is also advised to rotate the whole bird 180 degrees so both sides have equal time closest to the heat source in order for it to cook evenly. Soak your fruit wood in water for a couple hours to allow them to smoulder instead of burn on your smoker. You can either soak your wood or use a foil pouch with holes in the top or a metal smoker box. Mix all of the chicken seasonings together in a mixing bowl and rub the entire outside of the chicken. You can also separate the breast meat from the skin and rub some seasoning directly on the breast meat to season the meat directly. Light your smoker until it warms to 250 degrees. Place the whole chicken on your smoker, and your smoker wood, and shut your grill lid. Leave the vents on your smoker at least a quarter of a turn open. Make sure your chicken is cooking correctly and check that your smoker is holding temperature after about an hour. This is a good time to load up some more smoker wood while you are already opening the smoker. Try to limit the amount of times you take off the lid to check on your chicken as it will release smoke and heat that are important to maintain evenly throughout your cooking time. After 2 hours, you may need to rotate your whole bird to make sure it is cooking evenly. Total cooking time for a whole chicken varies but will likely be 3-4 hours. Check for a temperature of 165 degrees in the middle of the breast before you can pull it off the smoker.